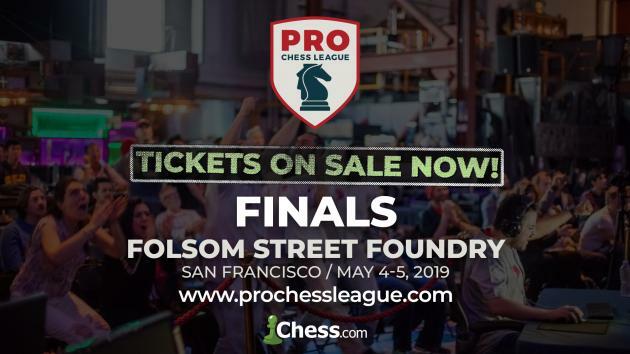 The PRO Chess League live finals return to San Francisco for 2019. Tickets for the PRO Chess League Finals in San Francisco are available here. Chess.com brings Professional Rapid Online (PRO) Chess League championship to Twitch. San Francisco, March 18, 2019—Chess.com, the world's largest chess site, and Twitch, the leading service and community for multiplayer entertainment, announced today that some of the world's top chess players will travel to San Francisco to compete in a live championship. The event will be the culmination of Chess.com's Professional Rapid Online (PRO) Chess League, a groundbreaking, season-long competition featuring some of the world's top chess talent representing international regions. The two-day finals start at 10 a.m. PDT on May 4 at the Folsom Street Foundry in San Francisco and will be live-broadcast exclusively on Chess.com’s Twitch channel (Twitch.tv/chess). "Chess.com is thrilled to be partnering with Twitch in bringing some of the top chess players in the world to a live audience with the PRO Chess League,” said Daniel Rensch, Chief Chess Officer, Chess.com. "Since its inception, the PRO Chess League's goal has been to captivate fans and we feel that this event is the perfect way to cap off the viewership and participation milestones achieved during the 2019 season." The 2019 season of the PRO Chess League features 32 teams and some of the top chess players from around the world. Four of the world's five highest-rated chess players are in the league: Fabiano Caruana, Ding Liren, Anish Giri, and Shakhriyar Mamedyarov. The American stars Hikaru Nakamura, Sam Shankland and Wesley So also lead their teams into battle on a weekly basis. For a full list of PRO Chess League competitors, visit the official site: www.prochessleague.com. PRO Chess League concluded its regular season on March 12, and will hold playoff rounds March 19 and 23 to determine which four teams will qualify for the live finals broadcast on Twitch. Last year's stellar commentary team will be returning, with Grandmaster Robert Hess, International Masters Daniel Rensch and Anna Rudolf, and Women's FIDE Master Alexandra Botez providing analysis of all the action. The final four PRO teams in the playoffs will gather at the Folsom Street Foundry to play the league semifinals and finals on May 4 and 5, which will be held in front of a live audience, and broadcast live on Twitch. Competitors will play on computers in front of their opponents and the live audience. "The PRO Chess League has created a new way for Twitch's global community to engage with one of the world's oldest competitive games," said Michael Aragon, Senior VP of Content, Twitch. "With the continuation of this partnership, we are giving the game of chess the same elements and exposure that esports tournaments receive on Twitch, catering to both new and existing fans of the game." Fans of the final four teams will be able to purchase tickets to attend the event live at the Folsom Street Foundry to watch the championship weekend. Last season, the venue hosted a thrilling live finals, with the Armenia Eagles taking home the PRO Chess League title after a triple-overtime marathon. For more information on the 2019 PRO Chess League, including schedule, results, and team standings, visit www.ProChessLeague.com. Launched in 2011, Twitch is a global community that comes together each day to create multiplayer entertainment: unique, live, unpredictable experiences created by the interactions of millions. It brings the joy of co-op to everything, from casual gaming and world-class esports to anime marathons, music, and art streams. Twitch also hosts TwitchCon, the biggest Twitch community event of the year, where tens of thousands of people come together to celebrate and connect with others who share their interests and passions. We’re always live at Twitch. Stay up to date on all things Twitch on Twitter and on our blog.